The OzCharge Rescue Mate RM1000 is no heavy, cumbersome, always-flat-when-you-need-it traditional jump-pack; this is some techy stuff that works! 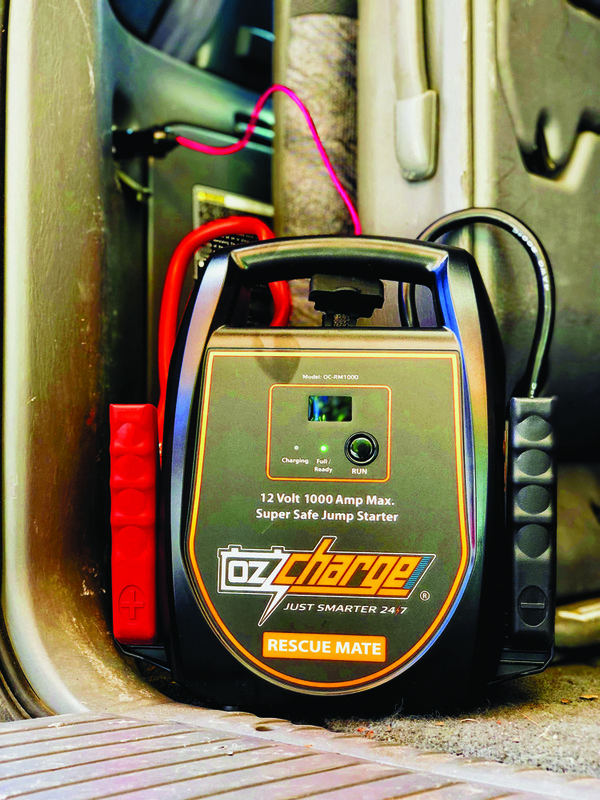 With no in-built battery, the OzCharge Rescue Mate uses super-capacitors to build a powerful charge quickly, even from a flat battery – not a fully dead one, but one unable to crank your pride and joy. The RM 1000 can draw from a battery as low as 3V. Most of the time your battery is ‘flat’ it is just below usable voltage; often only as low as 12V is enough to cause many modern engines to give nothing but the ambience of your dash lights, but in most cases, there is still light at the end of the tunnel. The Rescue Mate RM 1000 draws energy (amperage) slowly, typically taking 90 seconds to charge from a ‘flat’ battery; then by ramping up the voltage internally and multiplying with the amps drawn, it can pump out a short high-Watt burst to get you going. Charging it is super easy. I used my rear cigarette socket in my LandCruiser to charge the 2.5kg pack with the green screen indicting we had a charge ready in what felt like less than 90 seconds. Hooking it up to the battery terminals or designated jump point is as per any jump-pack/cables; once hooked up, you just press the Run button, get to the ignition, wait ten seconds for the buzzer to sound and crank the engine. If it doesn't start you have bigger problems, as the box says 1000amp at 12V; that’s as much as 12,000W or 12kW, more than the original Citroen 2CV created (only for a burst, so do not expect to drive on it). If typical engines require 3kW to 6kW to turn the starter, you should be able to start a stubborn old Patrol with mechanical TD42, an old LandCruiser 13Bt and anything newer of a similar size. Forget the car at home, the Rescue Mate RM 1000 wouldn’t flinch at a Commodore or Camry. The box says 10L petrol and 5L diesels; I would believe it. Our testing had the engine start like it was warm, with a battery in great condition and frankly, like it was new. This is some seriously cool tech. Should you have a monstrous V8 diesel, you may need more, or if you have a 24V system it’s a no-go; but for 99 per cent of us it’s a better option that a battery-based jump pack. It's lighter, easy to use and doesn’t need charging every couple of months. The price is not low, but for remote travellers it really is a worthy investment.